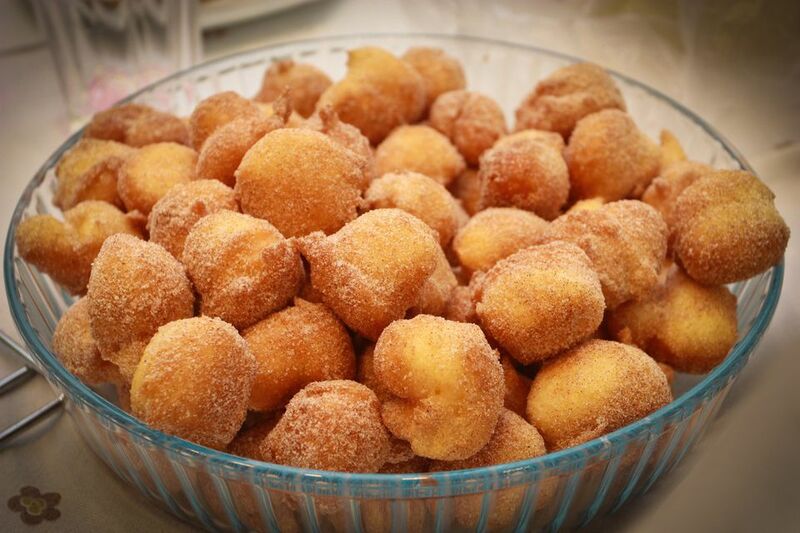 These Brazilian doughnuts, also known as bolinhos de chuva, are named for their raindrop shape. As you drop spoonfuls of batter into the oil, little peaks form, which become delicious crunchy bits on the outside of the doughnut. These cinnamon sugar doughnuts are very easy and quick to make, perfect for a weekend breakfast. In a deep fryer or skillet, heat several inches of vegetable oil to 360 F.
In a small bowl, stir the cinnamon into 1/2 cup sugar and set aside. In another bowl, mix together the flour, salt, and 3 tablespoons sugar. Stir in the eggs and 1/2 cup buttermilk with a wooden spoon. Add more buttermilk, slowly, until mixture has the consistency of a very thick cake batter. Using two teaspoons (or a small cookie scoop), scoop a generous teaspoon of batter and carefully drop it into the oil, using the second spoon to help scrape the dough off of the first one. Repeat with several more teaspoons, but do not overcrowd the doughnuts or they will stick together. Cook the doughnuts, turning occasionally, until golden brown on all sides. Remove doughnuts from the oil with a slotted spoon and drain briefly on paper towels. Roll the doughnuts in the cinnamon sugar while still hot. Cook the rest of the doughnuts in batches. Doughnuts are best served warm, and can be reheated or kept warm in the oven.